310 pages | 263 B/W Illus. Vibration and dynamics are common in everyday life, and the use of vibration measurements, tests, and analyses is becoming standard for various applications. Vibration Analysis, Instruments, and Signal Processing focuses on the basic understanding of vibration measurements and analysis. This book covers different areas of vibration measurements and analysis needed in practice, and discusses theory, application, and a variety of methods, in a simplified way. It communicates the fundamental principles of all three facets of vibration-based analysis, and highlights four major points—theory, instruments, experiments, and signal processing. Useful for everyday work, the book dedicates several chapters to the day-to-day requirements involved in vibration measurements and analysis, and addresses a number of topics useful for many day-to-day analyses and experiments. The book provides experimental examples in each chapter—considering basic theories and analysis methods, instrumentations and signal processing methods, and combined analysis—as well as experimental approaches and case studies. 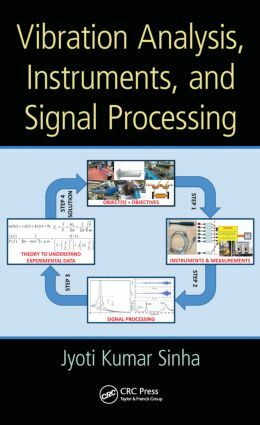 In addition, it dedicates a complete chapter to case studies relating the basic theory, types of instruments and measurements needed, and requisite signal processing that ultimately result in a final diagnosis. Developed for diverse audiences interested in vibration analysis, this book is suitable for every level of student, engineer, and scientist associated with vibration, structural and rotor dynamics, vibration-based diagnosis, and vibration-based condition monitoring. "Dr. Sinha is to be congratulated on his valuable addition to the literature. He gives the reader an excellent introduction to a wide range of topics and offers valuable insight into the way in which instrumentation and theoretical techniques combine in the resolution of real problems." Dr. Jyoti K. Sinha received his bachelor’s degree (mech. eng.) from BIT, Sindri (India), and master’s degree (aerospace eng.) from IIT Bombay, Mumbai (India). He completed his PhD from the University of Wales Swansea, UK. Dr. Sinha joined the School of MACE, the University of Manchester, in January 2007. He is the author of more than 60 technical reports and 135 technical papers. Dr. Sinha is also the associate editor of two international journals, Structural Health Monitoring: An International Journal and Journal of Vibration Engineering and Technologies, editorial board member of the journal Structural Monitoring and Maintenance, and coauthor of two books.